"Leo is a handsome 3-year-old boy who is also a registered service dog. 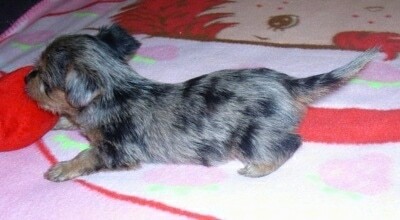 He is a true Silkyhuahua who came from a fullbreed Silky mother and a Silkyhuahua sire." 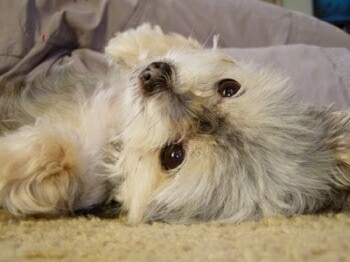 The Silkyhuahua is not a purebred dog. 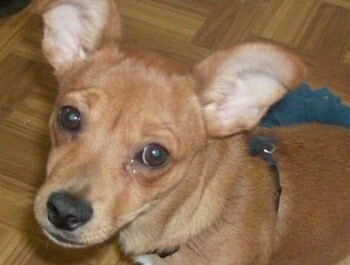 It is a cross between the Chihuahua and the Silky Terrier. The best way to determine the temperament of a mixed breed is to look up all breeds in the cross and know you can get any combination of any of the characteristics found in either breed. Not all of these designer hybrid dogs being bred are 50% purebred to 50% purebred. It is very common for breeders to breed multi-generation crosses. 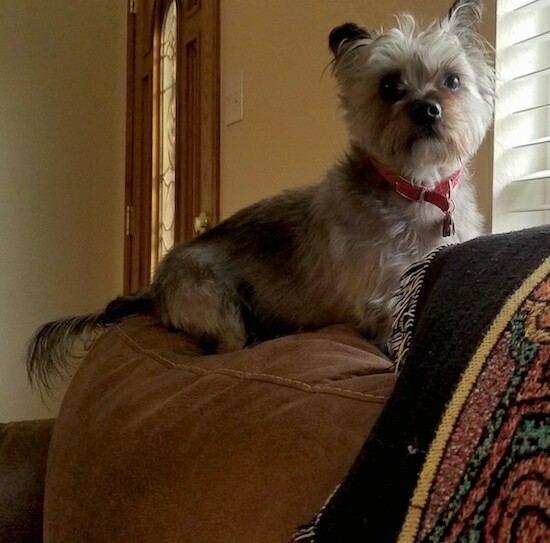 "This is my Chihuahua x Silky Terrier. Her name is Sooty and she will be 11 years old soon. 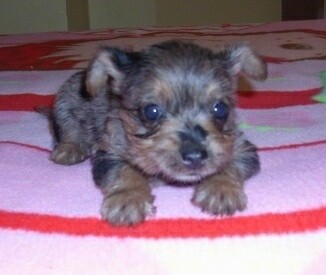 She weighs 4 pounds (1.97 kg). She has just had a major operation (breast cancer); another good reason to get your dog desexed that we didn't know about." This is Grizzly at 6 months old. His mother is the Silky and his father is the Chi. "I have a Silkyhuahua with very unique colors. 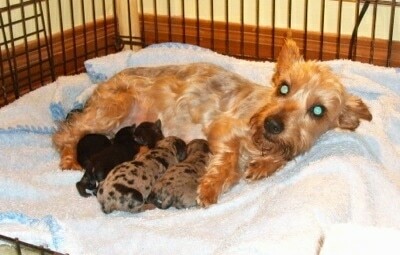 Her mother is a 7-pound Silky Terrier (shown above with her Silkyhuahua litter) and her dad is a 5-pound longhaired blue merle Chihuahua. My puppy's name is Rosie. She is teeny tiny and was about 3 pounds at 4 months old. 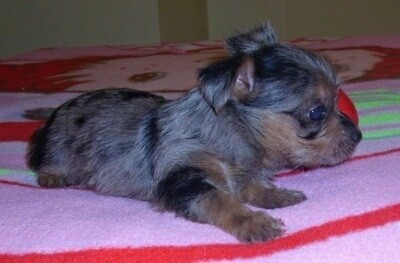 She will only be around 4 pounds when she's fully grown." Rosie the merle Silkyhuahua shown here at 8 weeks old—"She is a really smart puppy. At 4 months old she looks for ways to get to certain places by climbing and she acts like she's a Billy goat. As small as she is, she jumps amazingly high. She should have been named Zipper because she zips around the house so fast it's hard to keep your eyes on her."